That helpful, laughing lady who has been behind the counter at Tofino Sea Kayaking these past eleven years is… an American! Sarah Timberlake was born in Akron, Ohio. She has already absentee voted in the U.S. election, and purposely did so through her mother’s address in Florida, “hoping it will help”. How did Sarah end up in Tofino? Like most people do: by taking a winding road. While attending graduate art school in Michigan, she applied for an exchange program with Nova Scotia College of Art & Design. For two years she did her “post-Masters”, working in her own studio with textiles and ceramics. That’s the other surprise. Sarah is Tofino’s other ceramics artist. Our secret potter. While at Halifax, Sarah was offered a scholarship to the Banff Centre School of Fine Arts. After that two-year program she was handed a job in the small art department of a helicopter skiing company doing advertisements, brochures and silk screening. One day Sarah met Pete Moffat, of Tofino’s Bottomfeeders and choo-fm fame, at a Parks Canada truck rodeo. She was hiding out from Immigration at the time. Pete was a heavy equipment operator for Parks. Sarah emphasizes that his ability with a big truck was not what she found attractive; his musical talent was. He was playing the mandolin around a campfire. They married in Banff in 1989. She had tried teaching while in the U.S. between Canadian sojourns, but by now she knew she didn’t want to remain in the academic world. “It was too political.” The couple wanted to have babies, which meant leaving a place they were starting to find expensive and materialistic… the same reasons some people cite when departing Tofino today. And Banff, like Tofino, was a difficult place to leave. They both had good jobs, but could not afford a home. There were only two possibilities, as far as the couple was concerned. The island of Dryden in Ontario where Pete was from… and Tofino. Sarah found she wasn’t crazy about Dryden, whereas they both had instantly liked Tofino when previously visiting here. It was as simple as that. They fell in love with Chesterman Beach, and found they could just afford a piece of it. Two children came: a boy, Chance, now fourteen years old, and a girl, Blaze, who’s nine. At first, Sarah was a mum at home while Pete worked for Highways. Then she made an attempt with friends at “gallery life”. “It takes a long time to make a living from a gallery.” When she took a job with Pacific National Group, it included computer skills training–which was why Tofino Sea Kayaking hired her. Soon it became clear that Sarah was highly social, liked people, and suited tourism for those reasons. So she was placed on the front line, where she has been ever since. It would not be stretching it to say that Sarah and Pete are two people who help to keep the west coast running smoothly for visitors and locals alike. And then there’s their house. The front door is purple, and every wall inside has been painted a different colour. There are geckos, the Uffington White Horse (a giant figure carved out of a chalk hillside in England), a mask, tribal flutists and a work in progress of Pete in Bottomfeeders mode, in silhouette. All by Sarah. How else does she exercise her creative impulses? Silk-screening. She has printed t-shirts for the likes of SoBo, the Lantern Festival, the Botanical Gardens, Raincoast Interpretive Centre, and Tonquin Nature Reserve. After spending more than half her life in Canada, why won’t Sarah pursue citizenship? It’s because there is talk of bringing back the draft down south, and she heard a rumour that her kids, who have dual citizenship until age eighteen, could be drafted into the American army if their mother became dual as well. Surely too twisted to be true. Do some more research, Sarah, so that maybe one day you can vote in our elections too. 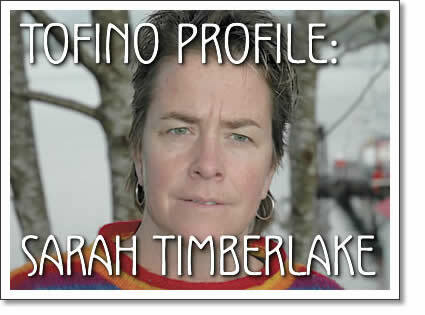 Tofino profile on Sarah Timberlake, written by Chris Lowther for Tofino Time Magazine. Published in November 2004.